Strategies for Ranching on a Landscape with Wolves – United Community Partners, Inc. Please note: To attend the workshop you MUST pre-register and pay by Jan. 5th as the meal plan is pre-purchased by Shella DelCurto and the team putting on the event. Guests will not be able to purchase tickets on the day of the event. This two-day seminar combines the fields of ranching and wildlife management to seek creative ways to minimize livestock losses due to wolf depredation in large pastures and open range. The workshop leaders are Andrew and Hilary Anderson, co-founders of the Tom Miner Basin Range Rider Project. 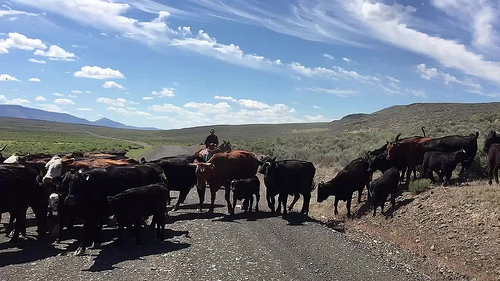 The Andersons are third-generation cattle producers successfully ranching on the outskirts of Yellowstone National Park where wolves and grizzly are a regular factor of life. Participants will learn about the many proactive techniques ranchers can use to tackle tough issues – including understanding wolf behavior, range riding, low-stress livestock handling, carcass management, profitability of different management regimes, and community-based problem solving. This is an opportunity to find something that helps the profitability and resiliency of your operation. There will be practical advice and inspiration that may help your ranch or community address complex issues on the land. There will be an optional after dinner discussion on Thursday. Pine Valley has typically been a very tranquil place to live. There is a lot of ranching here. With ranching comes challenges. In April, local ranches came face-to-face with one of those challenges. Wolves have taken up residence in our valley and the surrounding area. With wolves came depredations. Calves and cows were wounded and ultimately, some died. As a local rancher, my husband and I were in the middle of this depredation. We didn’t know how to protect ourselves, our livestock, and ultimately our livelihood against this challenging predator. We struggled and stumbled along, feeling totally inadequate. We got through the spring by trial and error. We knew we needed to find a way to better prepare ourselves for the coming spring. Images of calves attacked by wolves at Shella’s place. NOTE the images are gory so we have put them behind this link. In September, we were offered that opportunity. Defenders of Wildlife were willing to send both of us to Tom Minor Basin near Gardner, Montana. We attended the four-day Range Rider workshop, looking for answers. What we found was hope for the future, in the form of Hilary and Andrew Anderson. They were the workshop leaders and are co-founders of the Tom Miner Basin Range Rider Project. The Andersons are third-generation cattle producers successfully ranching on the outskirts of Yellowstone National Park, where wolves and grizzly bears are a fact of life. They have been dealing with wolves for many years and have had some significant successes in reducing depredation. The west boundary of their ranch is West Yellowstone Park, where the wolves and grizzly bears know no boundaries. We came away with a different outlook about our situation as well as those of our fellow ranchers. We had hope for the future. We decided then that if the Andersons and their ranching neighbors could implement a plan and make it work, then maybe we could, too. If they can survive among one of the largest populations of grizzly bears, and where wolves abound, then we can survive here in the panhandle of Baker County. Plans were then set in motion to bring the Andersons to Oregon for our ranchers and interested parties. We wanted to share the knowledge we found with our fellow ranchers, where wolves are going to be an everyday way of life. This is a chance to become proactive, not reactive. As Hilary Anderson says, “We do not own what we do not create.” To that end, we are bringing Hilary and Andrew to Halfway so that we can learn from their experiences. Not everything the Andersons share will work in every situation, but certain tools and techniques may make a big difference in some situations. This is an opportunity to see if you might find something that works for your operation or the operations you ride for. The Andersons will share their experience about the costs and benefits of each non-lethal or husbandry method. Business profitability and sustainability is a theme that may be most appreciated by livestock managers and owners. Shella DelCurto at mightyadashin@gmail.com or (541) 519-5563. With the help of United Community Partners as fiscal sponsor, ODFW, Defenders of Wildlife, and you — our community — we can raise the money needed to bring this great resource to the Panhandle. *Please note by registering for the event you are agreeing to be contacted by United Community Partners and our event partners via the email and phone number you supply.